Bowling Green's Chris Nell handles the puck against Bemidji State during the semifinals of the Western Collegiate Hockey Association Playoffs (Photo by Todd Pavlack/BGSUHockey.com). Chris Nell has always dreamed of playing in the National Hockey League. The Bowling Green junior is one step closer to reaching his goal. The goalie signed an entry-level contract Thursday with the NHL’s New York Rangers. The undrafted free agent is the second Falcon junior to forego their senior season to sign a pro contract. Defenseman Mark Friedman signed with the Philadelphia Flyers, who drafted him in the third round in 2014. Nell played in 34 of BG’s 41 games this season, posting a 2.15 goals-against average and a .916 save percentage. He started 33 games. He finished his career as BG’s all-time leader in goals-against (2.07), save percentage (.922) and shutouts (11). He had a 41-29-10 record in 84 career games. Nell had a difficult season on and off the ice following a terrific sophomore season when he posted a 1.31 goals-against average and a .930 save percentage in 37 games to earn first-team All-Western Collegiate Hockey Association honors. But his dad, Rick, died unexpectedly Sept. 12, and the 6-foot-1, 184-pounder didn’t play well early in the season. He stopped only 76 of 91 shots in his first four games, but gradually improved his play as the season went on. Nell had a 1.63 goals-against and a .941 save percentage in 15 games after returning from the Christmas break. He posted three straight shutouts in February and had a school-record scoreless streak of 220:18. 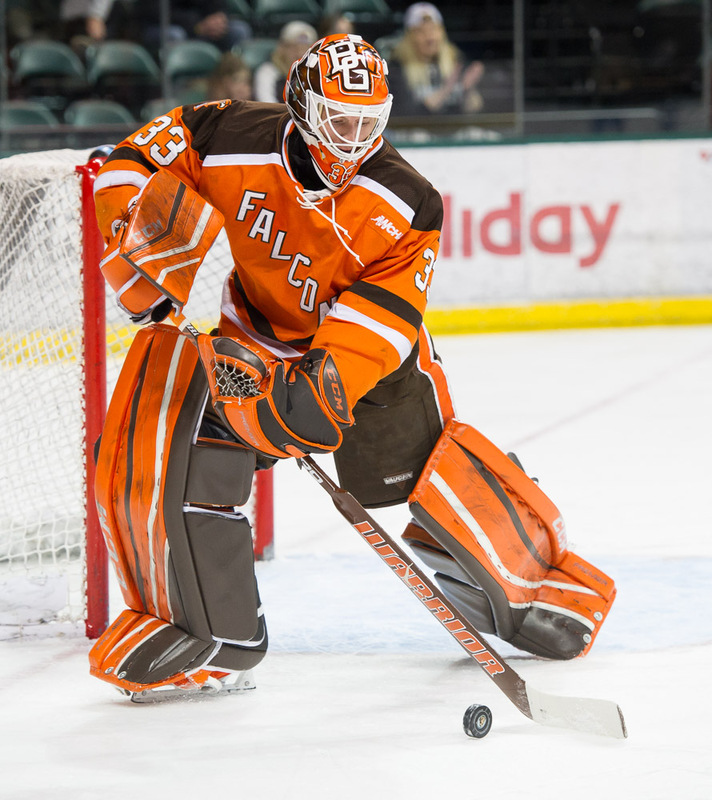 His play was one of the major reasons the Falcons won seven straight games late in the season and advanced to last Saturday’s championship game of the WCHA Playoffs where they lost at Michigan Tech in two overtimes. Nell will report to Hartford on Wednesday and is expecting to play in a couple of games with the Wolf Pack. The team is the Rangers’ top minor-league affiliate and plays in the American Hockey League. If he doesn’t stick with the Wolf Pack next season, Nell could be assigned to the Rangers’ ECHL affiliate in Greenville, South Carolina. Nell starts his pro career after playing well during the second half this season. Nell returned to BG for his junior season after receiving interest from the NHL last season. The pros were interested in the 22-year-old again this season, but he told his family adviser he didn’t want to know of the teams interested until BG’s season ended. The Falcons returned from Tech Sunday, and Nell learned of the pro interest in him after that. He decided to sign with the Rangers Thursday. Even though Nell is leaving BG early, he said he’s committed to earning his degree in marketing. He has a 2.7 grade-point average. Before going to Hartford, he’s meeting with his advisors to finalize his future academic plans which most likely will include attending summer school. Also this week, two BG senior forwards signed ECHL contracts — Kevin Dufour with the South Carolina Stingrays and Matt Pohlkamp with the Toledo Walleye.